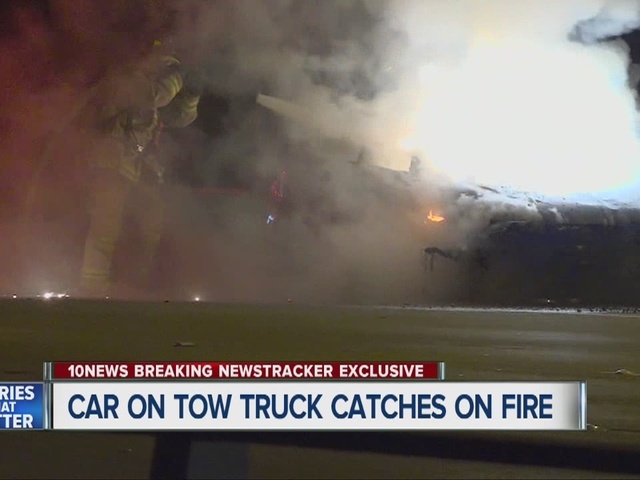 SAN DIEGO – A car burst into flames while on the back of a tow truck on Interstate 805 in the University City area overnight Thursday. The incident began at around 8:30 p.m. Thursday, when the car was involved in a hit-and-run crash on westbound State Route 52 at Convoy Street. The car caught fire and went into a ditch. San Diego Fire-Rescue crews responded and extinguished the blaze. Then then tow truck arrived to take the car away. The driver attached the car to his tow truck. At about midnight he began to make his way back to the tow yard on southbound Interstate 805, just south of SR-52. However, the car suddenly caught fire again while on the back of the tow truck. Some quick thinking by the driver kept the damage from being much worse. "I started seeing some flickering coming off in my rear view,” the driver told 10News. “I looked back, and sure enough it's on fire. I pulled over real quick and tried to put it out with my fire extinguisher, and it wasn't happening. So I lowered my bed, unhooked the hook and I just dropped it real quick and took off. Right after that it just engulfed in flames." SDFR crews responded for a second time and extinguished the car fire. The circumstances of the hit-and-run crash were not confirmed. There were no reported injuries.